The Huawei P10 Lite comes with the company's own EMUI ROM. It is now up to version 5.1, and we have already seen it on the P10 series and the Honor 8 Pro. The OS is based on Android 7 Nougat. There is a clear stylistic progression from the previous generations of the launcher. There are now different colors and themes crafted from the ground up by Huawei's design team. Most of the Emotion UI 5.1 upgrades reside under the hood and offer boosts in various performance aspects - memory management and faster touch response. There are some relatively simple things, like improved mis-touch detection, better dictation algorithms, and Moments, for more convenient photo organizing. There are a few major new background systems put in place. Huawei also talks a big about advanced machine learning, designed to catalog and predict your behavior and allocate CPU, GPU and I/O resources to the apps you use accordingly, making them more responsive. The lockscreen is one of the elements being carried over from previous versions of EMUI. The Magazine unlock style greets you with a different wallpaper every time you wake up the device, with new ones being downloaded when you connect to Wi-Fi and an option to delete the ones, which are older than three months. While still at the lockscreen, you can pull up an iOS-style menu from the bottom, where you get a ton of functionality. You can also quickly start the camera by a double press of the Volume Down button with the option to take a snap right away, or just go to the app. If you opt for a fingerprint unlock method, you probably won't be seeing much of the lockscreen anyway. The reader is blazing fast and using it is a no-brainer. EMUI 5.1 is so jam-packed with features left and right that you can't look at a screen without stumbling onto at least a few things worth mentioning. Still, despite all the customization freedom and the powerful feature bundle, on the surface, EMUI delivers great user experience. Beyond the lockscreen lies the homescreen and you get all apps there - an approach that Chinese manufacturers have borrowed from the iPhone, but we can't blame them - it's how their main user base prefers things. For the rest, EMUI 5.1 gives you the option to pick the standard Android two-tiered interface with homescreens for selected app shortcuts and a dedicated app drawer where you will find all apps. EMUI 5.1 has Theme support, too. As previously mentioned, Huawei's design team has put a lot of effort into re-imagining various shapes and colors in the UI. The theme store offers a wide selection and some really artsy options. Of course, you can always keep things simple and only customize the wallpaper and possibly transition animations. The notification area is a 50/50 mix between stock Nougat and Emotion. Huawei has tweaked the look of the quick toggles and added the auto-brightness switch, which Google so stubbornly refuses to keep in plain sight. The notifications themselves look just like the Pixel's. The task switcher is rather straightforward, but again with added functionality over Google's own - apps in the rolodex can be locked by tapping on the padlock icon, so killing all apps will spare the locked ones. There are a few other interesting tweaks you can apply to the status bar. For example, notification icons can be replaced by a simple numerical counter. You also have control over whether the notification LED and display should react to a new notification. 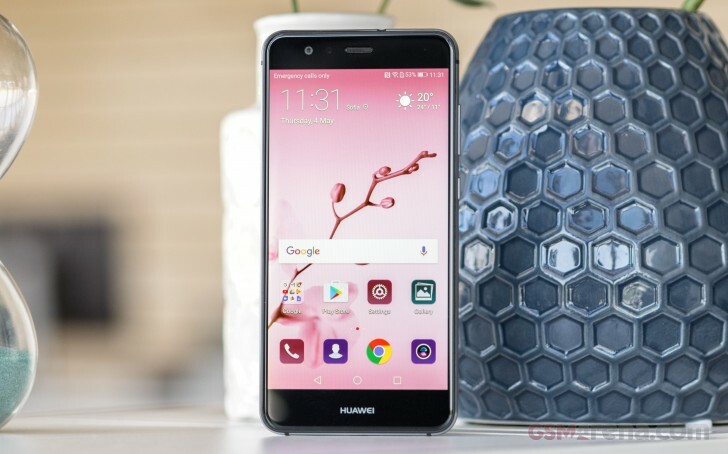 The Huawei P10 Lite features granular notifications control - Huawei had that even before it was a part of Android itself. You can control which apps can send you the three types of available notifications - the shade notifications, the lockscreen notifications and the banner style notifications. This level of control is also employed when it comes to the app access to network data and permissions. The user can control the rights of each application to access either WiFi or mobile data. This can save a lot of traffic and help you optimize your data plan and consumption in an easy and convenient way. You can also rest assured that there is no unregulated access to your personal data or phone sensors. Last, but not least, there is a dedicated menu for controlling crucial permissions on a per-app basis. It's a great addition, since you don't want a random app ignoring the system's attempts to optimize its power consumption, or drawing over other applications. While these are options accessible from the settings menu, most of them are also featured in the Phone Manager app. In there you'll also find a one-touch optimization button. A virus scanner powered by Avast is on board as well. Two battery saving modes are available from the Power manager. There's Power saving, which imposes some minor limitations on hardware and software, and then there's Ultra power saving, which condenses your entire phone's functions to a single black homescreen with six shortcuts. You can customize those shortcuts, and you can pick from any app on the phone, so this mode is more of a psychological constraint to prevent you from using many apps simultaneously than anything else. By Huawei's estimates, that should triple your battery life, so apparently, there's more going on under the hood. Ah, there's no task switcher in this mode, you only get one app at a time, though judging by the loading times, they have to be in the RAM. Screenshots are disabled. Huawei's EMUI offers App twins for multiple instances of a single application. Sadly, in its current state, the feature only works with Facebook and WhatsApp and no other app. Huawei offers a variety of useful gestures and tools in EMUI. Motion and knuckle gestures are available for the first time in the P Lite series. You drag your knuckle (not the tip of your finger) across the screen to launch split-screen multitasking. Tapping with your knuckles either takes a screenshot (single) or starts recording a video of the screen (double tap). You can customize various knuckle drawings by your liking, too. While those look cool on paper and worked mostly well on the flagship models, they aren't as comfy on the P10 Lite. It usually took three times until the phone acknowledged the gesture we were doing. You also get voice commands, which can be invoked any time just by pronouncing a trigger word. Finally, you get the option for having a Floating Dock, which you can position anywhere on the screen and it allows you to access a few shortcuts from anywhere you like. For certain scenarios, like in-car use, you can enable a Simple homescreen mode, which features large tiles for easy tapping. It's not particularly consistent, though, offering a simpler version of some menus, but not others - the dialer is the same size as in regular mode (in all fairness, it's fairly oversized to begin with).